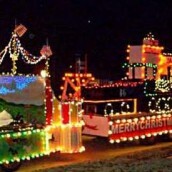 Join in on the Sparkling sensation with our towns' Parade of Lights. Parade Route: Front Street and Main, North on Front Street to Poplar, West on Poplar to 4th Street, South on 4th Street to Main Street, East on Main Street to Front Street. Starts at 6:00pm. For more information call the Logan County Chamber 970-522-5070.